Could anyone tell me if a stock BMW top case from a 1996 1100RT would be compatible with my 2010 R1200RT? I'm not sure how far back the mounting system on my bike goes back in the RT line. I know on many 3rd party cases the same case covers close to two decades of RTs, but wasn't sure about the original BMW cases. I'm looking at some used options from earlier years online but not sure if they fit. Anyone know of a reference chart that says what stock cases fit on what years? As long as I'm on the subject, what are your favorite 3rd party top cases that would fit a 2010 RT? How many of your prefer NOT to use a top case on long trips and instead pack your bike across the luggage rack and rear seat with your own dry bags, etc.? That seems like it might be more efficient use of space. FYI, I'm a new BMW RT owner. In the past I loaded down my Suzuki SV650S with stuff. It wasn't pretty, but I made it work. 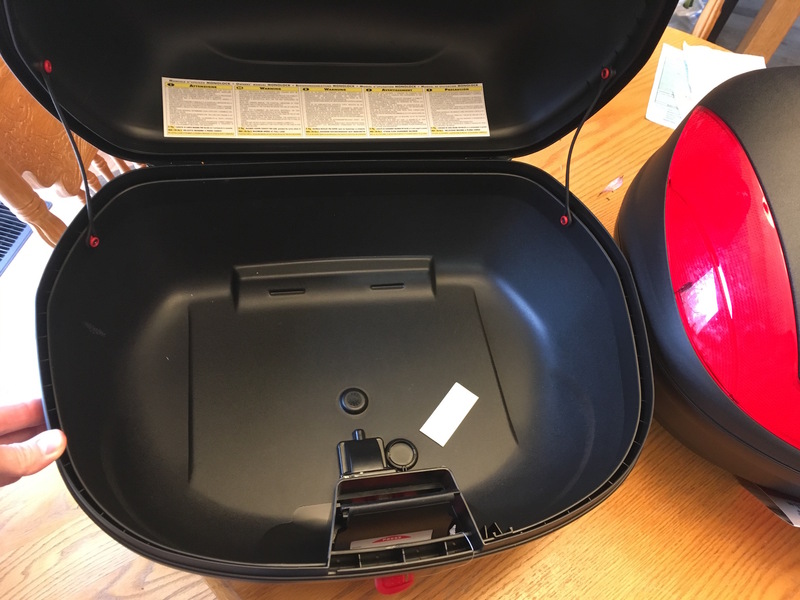 My recent purchase of a used 2010 RT came without the top case. Buying a replacement from BMW is out of the question ($$$). Part of my debate about what to get revolves around whether I want the top case more for in town commuting and convenience (especially when my wife is along), in which case maybe I would not go for the largest one available, or whether I want the largest possible to be most useful when I take road trips. I am not a person of unlimited funds, but I do want to get the right solution if I can afford it. The Shad 58l that adapts to two smaller sizes is pretty nice, but expensive - especially after you add in the back rest and brake light kit. A back rest is essential for use with a passenger (esp. my wife), and extra brake/running lights up high certainly seem like a good idea. I'm also looking at the GIVI cases currently. Might anyone also tell me how much drag and/or turbulence is produced by some of these cases? I'm guessing there is some variation here by design as well as size, so any thoughts/experiences on that point would also be appreciated. 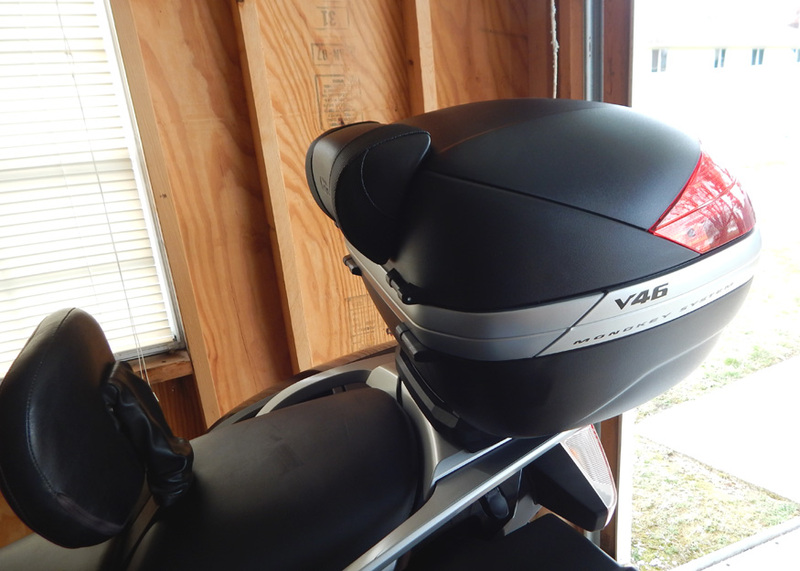 I just received the Givi V46 Monokey last Christmas, for my 2009 RT, and finally got it installed recently. Of course you have to get the compatible top case rack to mount it. I have the optional back rest pad for the wife, which you also have to install, and brake light. 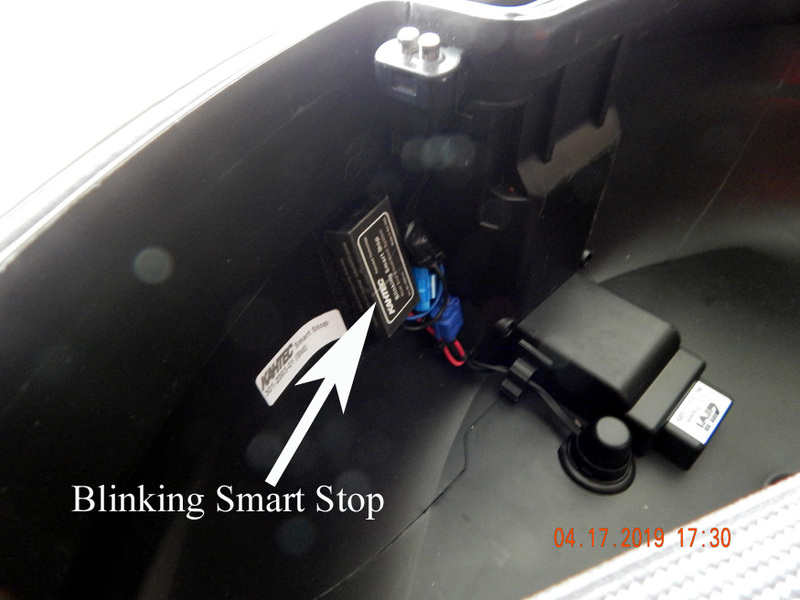 I modified it further to include additional brake lights and a blinking smart stop kit. But to answer your question, this was the best value for my money IMO. It holds two 3/4 helmets although one has to be turned sideways to fit. I have the original BMW 28 liter top case that looks decent but just didn't do it for me as far as available capacity, and the larger BMW case just cost too damn much for my older bike. I didn’t want a larger top case than the V46 as I thought it may look out of place. There are also weight limitations as with any top case. I haven’t done much traveling at distance or with it fully loaded so I can’t tell you if it will make the bike feel top heavy or not. I think it does look good though……. Thanks for that info ebiss9. I've looked at both the Givi Monokey and Monolock series cases, but haven't actually been able to examine any close up and in person. I agree that several of them look pretty good, including yours. I'm not sure if I want to go for a case that holds 2 full-face helmets or not. Kind of big but kind of a nice option to toss them in there. I wonder how much lighter weight the Monolock series is, as they are quite a bit cheaper. Thanks for that info TF 1200RT. Could anyone tell me if a stock BMW top case from a 1996 1100RT would be compatible with my 2010 R1200RT? You wouldn't want it anyway. 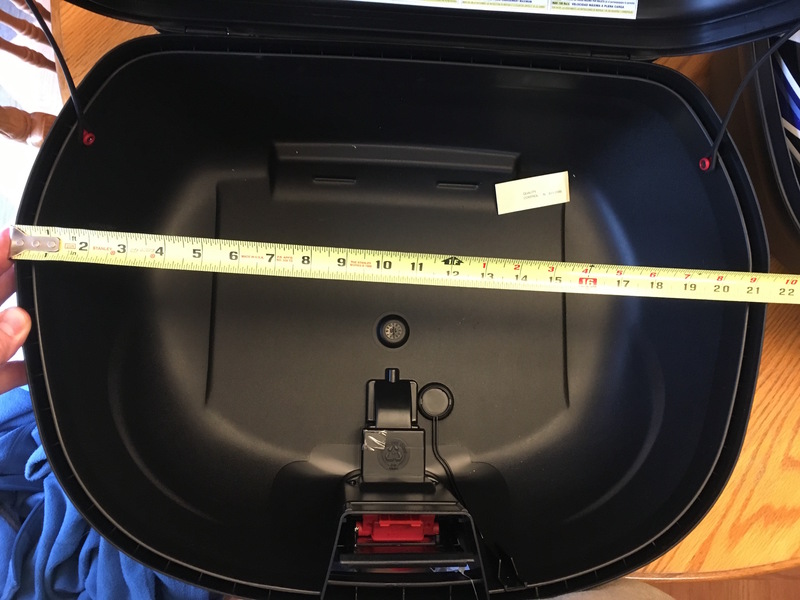 For such a large case it holds very little. As for cases that do fit. Most BMW cases from 2005 to 2019 RT's R's and RS's (and many K bikes),will fit (that is both the 28 liter and the large ones). As for aftermarket cases, my current favourite are the variable size SHAD cases which expand vertically to allow you to stick more stuff in them. I have a 2012 that came with the big BMW case. I think it is 41 liters. I hate the thing when riding solo it is like a sail you get pushed all over the road. It is nice if two up or a big dry bag behind the rider. 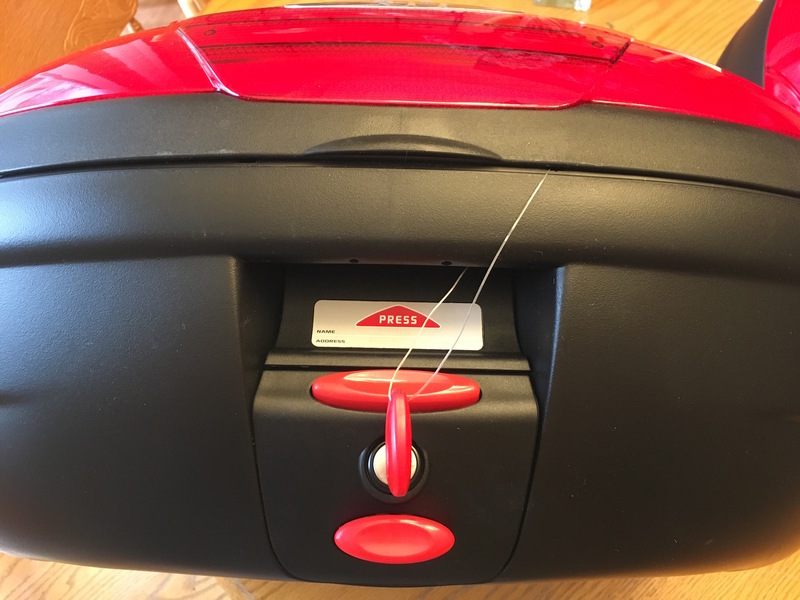 Givi you need the key to open it every time (it cannot be left unlocked) which also introduces the joy of accidentally locking your keys in the case. Look at the Shad cases. I recently bought a 39 liter case for my 2013 and it looks great and is of excellent quality. I have a detailed post over at the BMWMOA forum. I'd provide a link but I'm not sure linking to other forums is permitted here. Hi Zamram. I too dislike my large BMW case. Why? because it looks ugly! It has such wasted space inside with it's false bottom and carpet. However, as for it being like a sail and being blown around..I have NEVER experienced that (well, not caused by the top box anyway). I too think the OP should take a peek at the Shad expandable boxes. A top case from 1996 BMW is too old to fit a 2010 RT. However, the pre-2014 top cases (see photo below) do. I moved one from my 2007 RT to my new RT without difficulty, just repainting the lid to match the RT. They have another advantage -- the large top cases cost about half what the newer BMW top cases cost. The small cases are the same from 2005 through 2019. I disagree with "Bandytales." I think BMW top cases look like the belong on BMWs. I have yet to see an aftermarket top case that looks that way. Last edited by jeffdean; Apr 10th, 2019 at 12:43 pm. I ran a SHAD SH-48 on my FJR and was going to keep it when I decided to move on the the RT. But the used RT I ended up buying came with the factory topcase so I sold the SHAD. 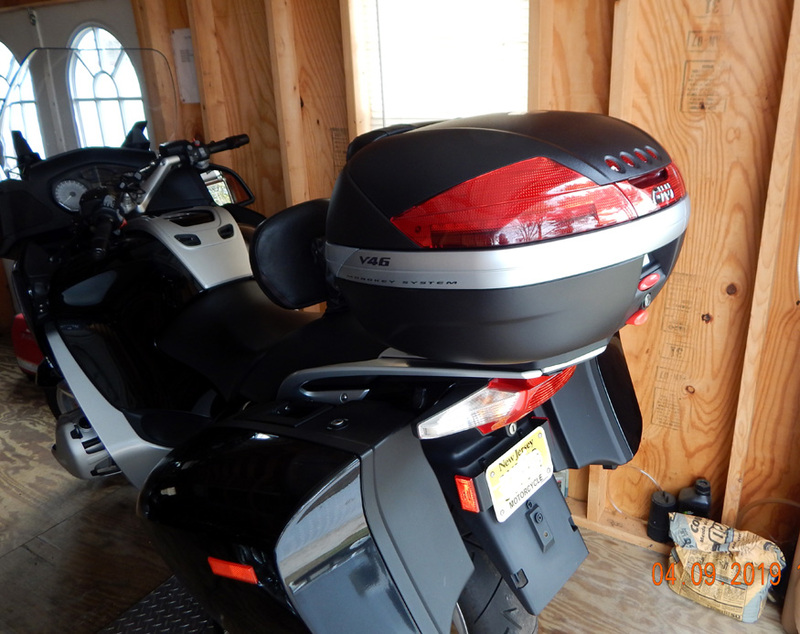 I had the optional backrest pad and my wife said it was fine for her on the FJR. It was good quality, held 2 medium full sized helmets, was quick and easy to remove, and looked pretty good. I ended up selling it. I bought it brand new on Ebay from a dealer as an open box item and got it for around $150 shipped. Then the pad was additional. I did not add a light. 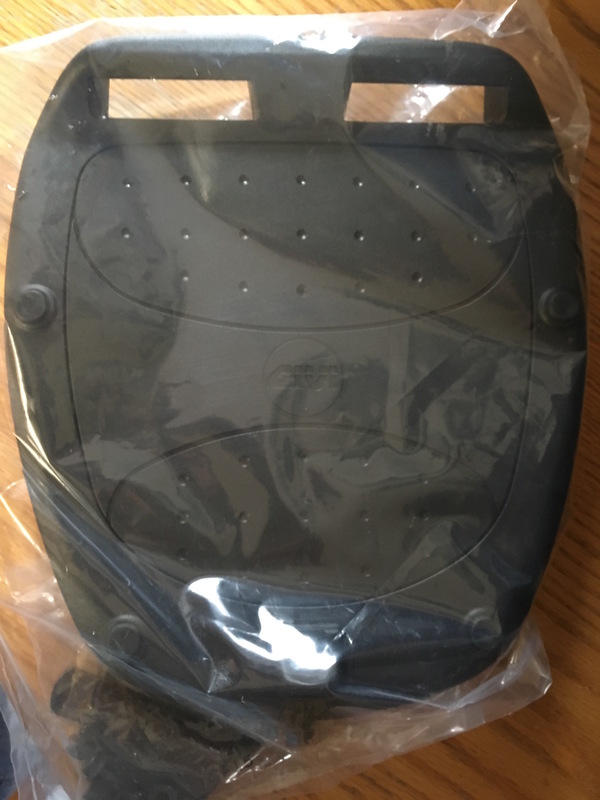 As someone else mentioned you will need the SHAD adapter plate for the RT. I've put BMW's 28-liter case on my '06, '13, and '16 RTs. I painted their tops to match the bikes. 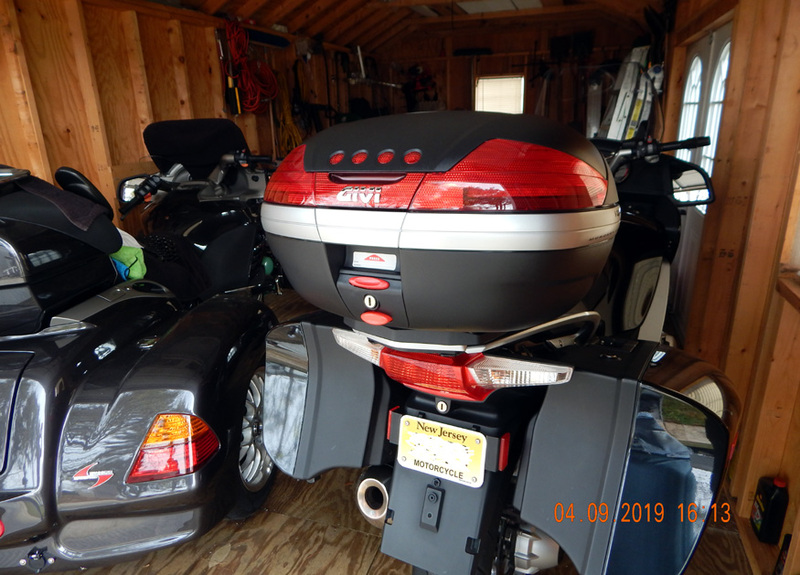 It's well built but not heavy and is keyable to the bike, holds a helmet and more, looks great, makes a good passenger backrest, is not sensitive to side winds, and it doesn't block the rear view as the large case does. A box tail light isn't necessary to me since I always install supplemental LED tail/brake/turn lights. Have you considered CraigsList? Here is one in my local Orange Coast, CA edition that clearly needs paint, but IMHO they need to be color matched anyway ;-) Not saying this is a great deal, just using it as an example that they do come up every now and then. The BMW 49L case that I have does not have carpeting and a false bottom (I know because I have taken it apart). And as far as it being a sail, try riding a K1300GT with a top case in a crosswind and not being two-up. Not a lot of fun! It did work better on my R1200RT. I did an errand today that required the top case (went to buy the BMW Venting Suit because we're getting some hot days now ). It was windy through some of the more mountainous areas and I could definitely tell that the top case was on there. The sideways gusts had a greater impact on my line than normal. That being said, its not horrible and the capacity of the box outweighs the wind profile IMO. Thanks for that. Yes, I've been watching Craigslist, and also eBay, but haven't seen anything compelling in my area just yet. Have seen some used Givi top cases out there though. I hate the top case. For 2 reasons, I kick it every time I sling my leg over the saddle. I found the case was also very large outside for minimal storage inside. I see you've looked at my pelican case setup, It's still my favorite top case option I can attach either the 1510, or the 1610. Very utilitarian but I've got no issue with that. Form before fashion.. The 1510 has a nice low profile so It's not a sail. The 1610 is more like a box van on the back.. When I need more "stuff" with the 1510, then I just ratchet strap my duffel bag on top of the pelican.. Yes, I did look at that Pelican setup. Looked pretty cool, although I'm not sure I'd be as adept as you in fashioning a system to attach the Pelican to. If I go the more utilitarian route I will maybe try your approach out. Well, I've ordered the Givi Monolock 450 and Monolock 470, as well as the Shad 58 expandable. I'm going to get my hands on them directly and compare. I can return any/all of them for free at Cycle Gear if I don't like them. I'll post an update after I have a closer look at them. In the meantime any other comments and recommendations are still welcome. Although it does require a key to open the box latch every time, I tried to close the latch with the key out of the lock and could not. Unless things have changed recently with Givi locks, you can't accidently lock your key in it. Well, that would be good thinking on their part for sure but HAVING to use a key every time would still a pain in arse to me. ebiss9 and North Woods Wanderer like this. 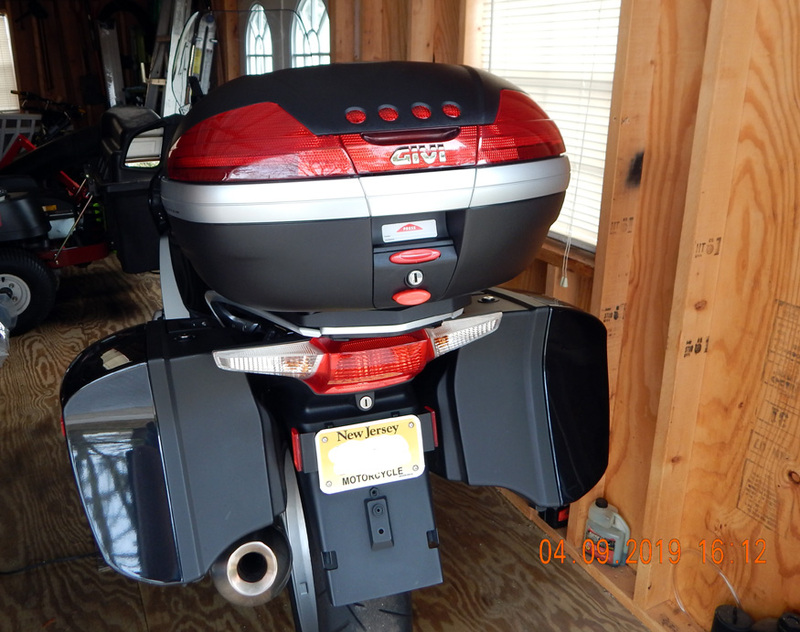 I bought the Givi 56 liter case, the light kit, and the aluminum top case rack. The case and the rack had obviously been sold, returned at least once, and then sold again to me. The case was in good shape. The rack was missing parts. The rack uses non removable fasteners in its installation. Those fasteners were already installed by the previous owner. I didn’t care for how the rack installed on the bike. It complicates the removal and the installation of the bike’s luggage rack. I ended up returning it all for someone else to buy. I found a good enough deal on BMW 49 liter top case. It was old new. I like it. I like the way it attaches to the bike’s rack. It is designed for the bike. I avoid a dodgy installation of someone else’s adapter plate. I only use the case on multiday trips to help me carry my stuff traveling. When I get to my destination I take it off and leave it in the room like a piece of luggage. I don’t need a trunk on my bike to store my helmet. How the case attaches to the bike was important to me. Everyone has their own need and desires. After market cases offer some attractive alternatives to the BMW case. You can certainly save some money going after market. I like saving money. 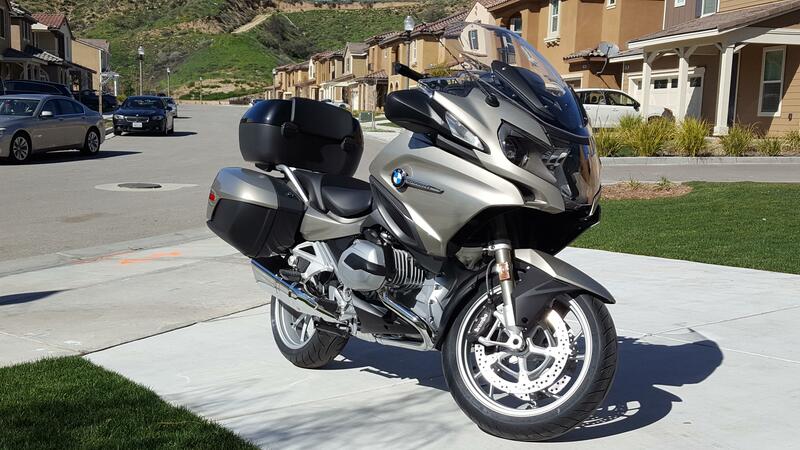 New member joining in here, as I just bought a 2013 R1200RT. I commute daily on Southern California freeways, and because of the ability to lane-split here, I really like leaving the panniers at home and use a top case to store my gloves and helmet at work. 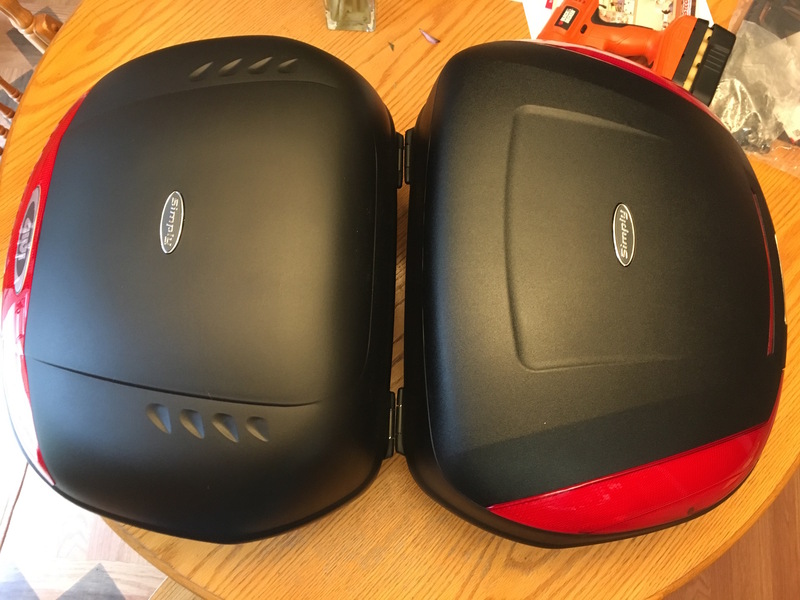 I have used top cases on my last 3 bikes (Suzuki V-Strom and Bandit 1250, as well as my still current Triumph Tiger Explorer) and really find them useful. I was looking for a BMW 49L top case and missed out on a near-new one on Craig's list for $500, which I though was a decent price. Of course, I'd still have to re-key it to my bike, adding to the cost. No way was I going to consider buying a new one. Most of the used ones I see on Craig's list or e-bay are pretty ratty and would need some refurbishing. Since I already have a Givi V-47 with aluminum trim on my Triumph, I decided to get the Givi adapter for the RT. This was around $100 from Twisted Throttle. Fitment was pretty straight-forward, but a little fiddly with the metal spacers that fit into the holes in the BMW tail rack. 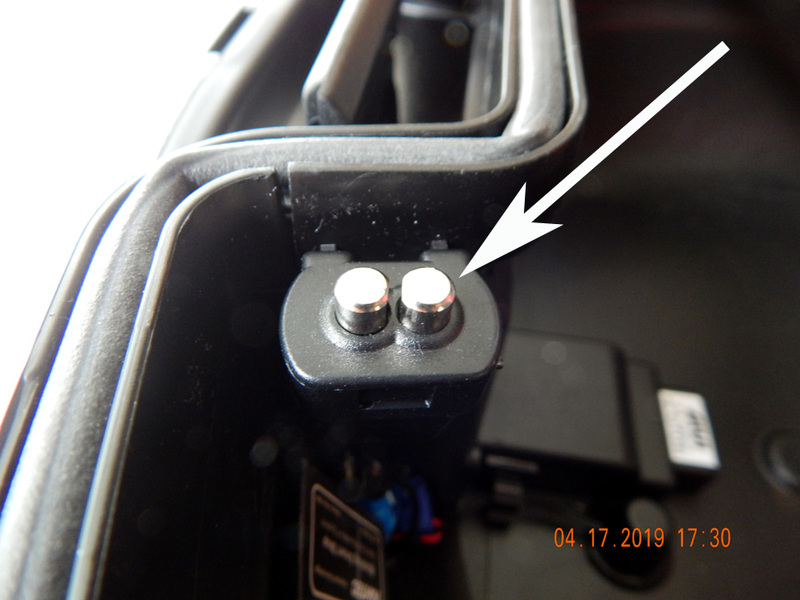 I did not go with the more expensive metal adapters as the molded plastic one is plenty sturdy (Same type as on my Triumph.) I don't mind carrying another key with my bike key. So the Givi looks fine on the bike, and the aluminum trim matches my grey RT well. 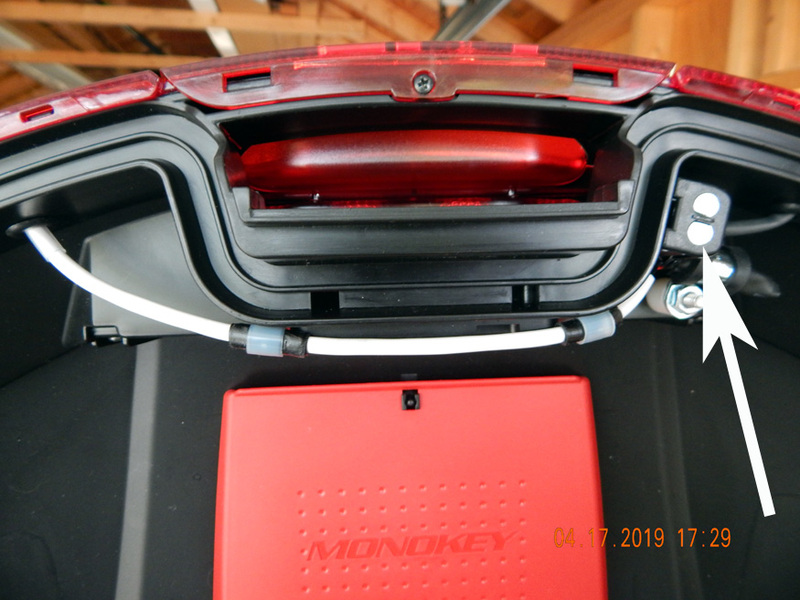 BTW, North Woods Wanderer mentioned the Monolock series; I think the Monokey series is more heavy-duty. The Givi works for me. Well, Cycle Gear cancelled my order for the Shad 58 expandable. Out of stock. That was the one I was most keen to have a look at, but they appear to be in very short supply. They did give me a $20 credit for their mess-up, so kudos to them on that. I've received the two Givi cases. I'm not sure what they were thinking when they designed the locking mechanisms on these but they are a total pain in the ***. Both the Monolock 470 and 450 use the same locking mechanism, which does work but is unnecessarily difficult to use. And you cannot remove the key with the case in the unlocked position. The 470 lock also appears to be partly defective. Before I even opened it the first time a little plastic piece fell out of the bottom of the case where it should attach to the base plate. 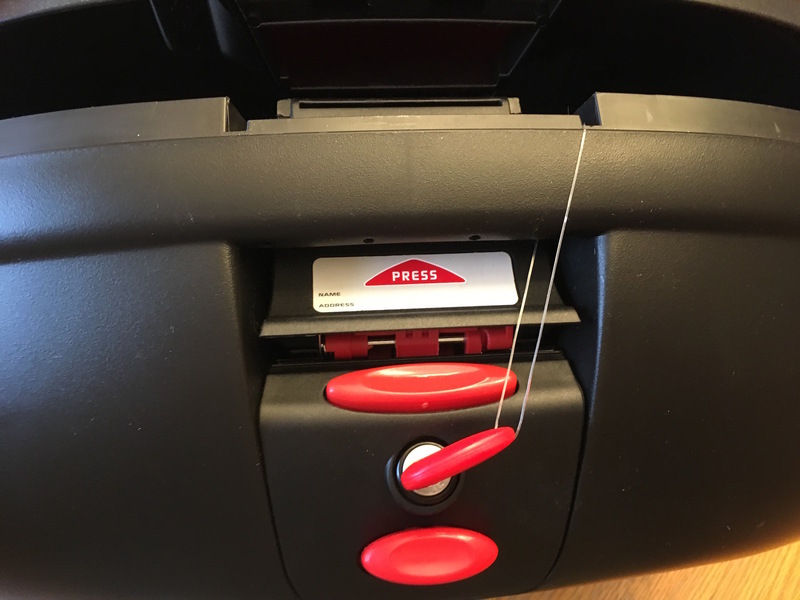 Even when the case is in the locked position on that case the release button to remove the case from the plate remains unlocked. 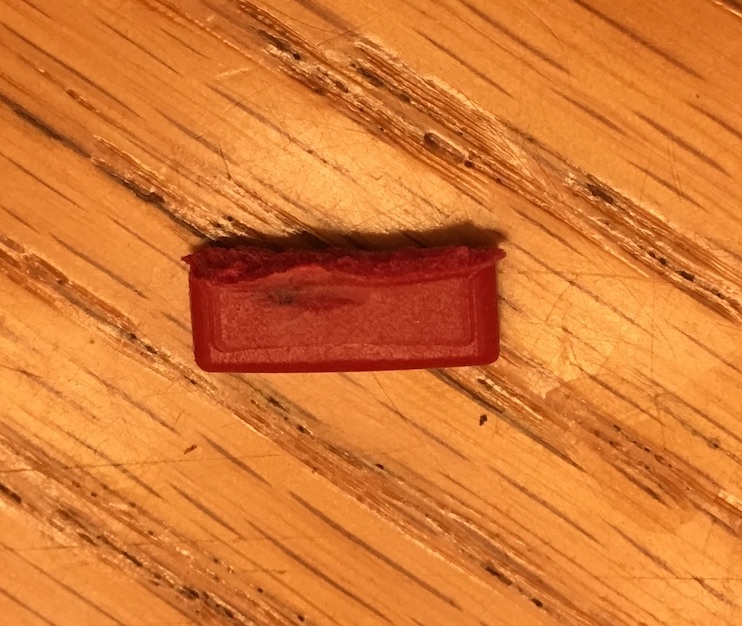 It appears that some tiny piece of plastic is all that the base plate lock consists of. If it breaks, the case can no longer be locked onto the bike. I prefer the styling on the 470. And they are close enough in size that I would take the extra 20 liters on the 470 over the 450 if the price was similar. In fact the bottom half of both cases is identical; the 470 just has a different top half that is slightly higher. 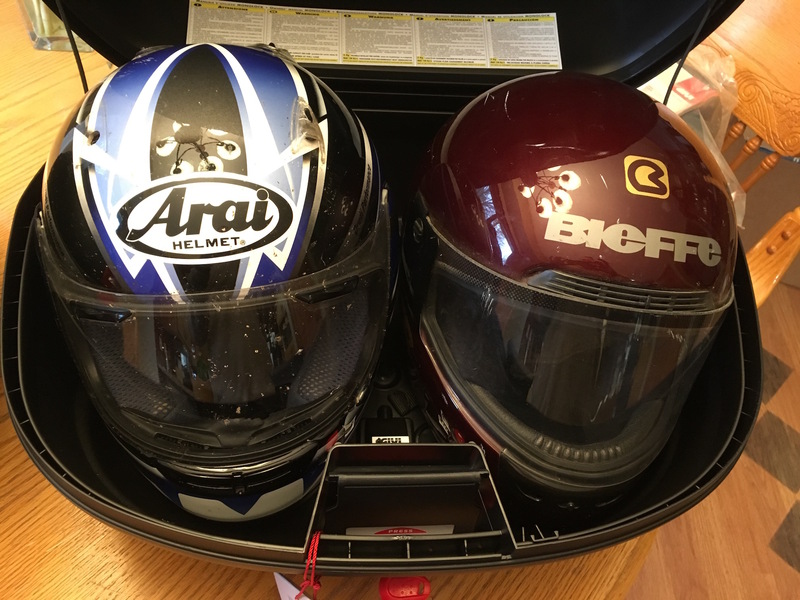 2 full face helmets fit fine in either, but in the 470 I could throw a fleece sweatshirt on top of the helmets and it would still close, not in the 450. They both use the same Monolock universal base plate. But I'm not sure I'm ready to settle on either of these yet. Maybe I need to look at one of their Monokey series cases. I did see a Coocase for sale locally on Craigslist. Looked nice and has some interesting features like power locks, but googling reveals that they've had a lot of problems with them. I've attached pictures of the two Givi cases above. I didn't look too closely at the mounting system to see how well the universal mount would work on the RT. When I have more time I'll try to do that. Get the Shad from Revzilla. Seriously, they have amazing customer service and returning it would be no problem. That's where I got mine. Do buy the RT-specific adapters. While it might be possible to mount it without, it would be very difficult. Good reporting about the lock on the Givi's. Cycle Gear and Revzilla are the same company. If one is out of stock, so's the other. My buddy George did mount the top case from his R1100RT on his R1200RT, but it required the adapter he made from a R1100RT rear rack. Besides being very handy in the work shop, he is a skilled machinist, so I’m not sure if this is an easy modification to do. I will say, it looks great, better than a GIVI or some of the other 3rd party top cases, and mounts & dismounts as effortlessly as on a R11RT.